Is there anything prettier or more nostalgic than a mantel decorated with pine boughs, poinsettia blossoms and candles? 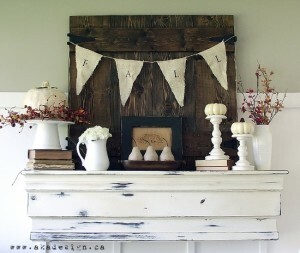 We used to have a beautiful mantel in our first home. I really miss it. I loved decorating it from Spring to Winter and especially for holidays. 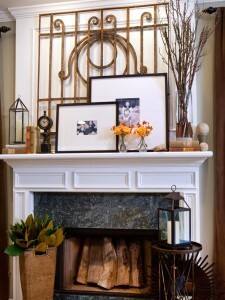 A mantel can be a stunning focal point. So, you ask, what if I don’t have a fireplace? Well, shelves aren’t just for books you know! Do some research and check out the beautiful mantels available and think “mantel minus sides (if applicable) = shelf = mock mantel.” A big, bold shelf hung low on a wall above a leather ottoman would be a striking vignette. I have the perfect place for this. I think I’m going to do it! Think outside the box. These beautiful pieces of art are too good to go to waste. Think, think, think! Where can I put one of these? My kitchen? My bedroom? Oooo! My bathroom!! I know! The entryway…….so many ideas, so few walls. I know, traditionally speaking mantels go over fireplaces. Well, remember those distressed brick walls we’ve talked about? 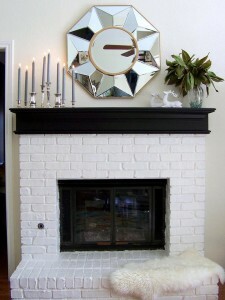 You can create a stunning “fireplace scene” using the electric heaters that look like a small fireplace, distress a wall with brick (not very hard), add a mantel and voila! I actually considered doing something very similar to this in our basement bathroom but we didn’t have quite enough room unless we eliminated the door. Not the best idea! 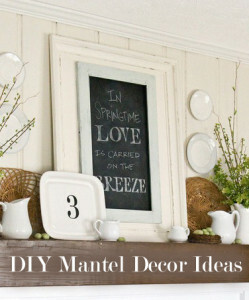 Remember: Mantel = big shelf. If you don’t have a fireplace, use some of these mantel ideas to create an impressive look on a shelf, and put it anywhere you want. Dazzling!